The most important skill for understanding scriptures, including the Bahai scriptures, is not mastery of the original languages, or other arcane knowledge, but familiarity with literary language: the ability to read poetry and similar writing. Religious language is necessarily metaphorical, using the physical world (as understood at the time) as a correlative and reflection of spiritual realities. A literalist mind-set makes a complete hash of reading any scripture. This is a problem in all religious communities today, as modernity has given such a high status to the hard sciences and their way of describing the world that many people have never learned to read literary language as literature. It is evident that nothing short of this mystic transformation could cause such spirit and behaviour, so utterly unlike their previous habits and manners, to be made manifest in the world of being. … Such is the potency of the Divine Elixir, which, swift as the twinkling of an eye, transmuteth the souls of men! For instance, consider the substance of copper (محاس / nahas). Were it to be protected in its own mine from becoming solidified, it would, within the space of seventy years, attain to the state of gold. There are some, however, who maintain that copper itself is gold, which by becoming solidified is in a diseased condition, and hath not therefore reached its own state. And if the touchstone is metaphorical, the copper and gold must also be metaphorical. The context gives us more clues. The previous context is the “mystic transformation” of certain “blessed souls,” and the point being made is that this can happen gradually, over a lifetime, or, with the help of the elixir it can happen in a moment. And then he argues, who is to say that somebody is not the real gold (just because he was something less than that previously), when the Touchstone is at hand and the Touchstone says “he’s real gold”? There are more indications that the transformation of copper to gold is being used simply as a metaphor. The copper is “in the mine of its own self.” Copper does not have a self, people do. Seventy years is the lifetime of a man. In that citation, Abdu’l-Baha refers to the copper being protected from a “preponderance of dryness.” Solidity and a preponderance of dryness are synonyms, in the physics that prevailed in the Islamic world at the time (which drew on classical Greek physics). This physics supposes that all things are composed of four elements: earth, fire, water and air, of which only the dry element, earth, is a solid. So if something is a solid it must by definition have a preponderance of dryness. Shoghi Effendi’s term “becoming solidified” is therefore a good translation, for a readership who do not know about the categories used in the physics of that time. A translator must always consider the readers as well as the source text, for the purpose of translation is to convey as much as possible of the source to an audience who cannot read the original, and have a different cultural and educational background. In other works by Baha’u’llah that refer to this physics and the alchemical process, the dry/earth element represents the body of an individual, and water represents spirit. So to be preserved for 70 years from a preponderance of the dry, is to escape the attractions of materialism, and benefit from a spiritual education, throughout one’s life. And potentially, to be transformed from a mixed character to a pure one, from copper to gold. The Book of God is wide open, and His Word is summoning mankind unto Him. No more than a mere handful, however, hath been found willing to cleave to His Cause, … These few have been endued with the Divine Elixir that can, alone, transmute into purest gold the dross (nohaas) of the world, and have been empowered to administer the infallible remedy for all the ills that afflict the children of men. In all but the last of these examples, and in the Iqan text, we see that ‘copper’ refers to the original lower station of the soul, while gold is the goal, the possible and desired station. Baha’u’llah refers to another way of using these metaphors, saying “There are some, however, who maintain that copper itself is gold, which by becoming solidified is in a diseased condition, and hath not therefore reached its own state. Be that as it may … ” This is a reference in passing, to the idea that we are born naturally noble, have descended into a base condition, and can return to our noble condition. If this was Europe, we would call this Rousseau’s glorification of the natural, and it is an idea that Abdu’l-Baha engaged with vigorously in his European tours. But the idea is not exclusively modern or western. It is also beside the point here, as Baha’u’llah says: the point is that the ‘elixir’ can cause an instant transformation. Reading on, Baha’u’llah says “the real elixir will, in one instant, cause the substance of copper (مادّه نحاسی) to attain the state of gold (مقام ذهبی), and will traverse the seventy-year stages in a single moment.” Substance here (Greek ὑπόστασις) is a technical term in neo-platonic philosophy and theology, referring to the unchanging ipseity of a thing. “State” here translates maqaam, and is a technical term in Sufi terminology. It is usually translated as “station,” for example “The station (maqaam) which he who hath truly recognized this Revelation will attain is the same as the one ordained for such prophets of the house of Israel as are not regarded as Manifestations ‘endowed with constancy.‘” (Baha’u’llah, quoted in Shoghi Effendi, The World Order of Baha’u’llah, p. 111). Gold and copper in this sentence are both in adjectival form, so we have the cupric substance attaining to (not being transformed into) the golden station. It is significant that the cupric substance does not attain to the golden substance: the ‘station’ or ‘state’ of a thing is the net effect of attributes that are attached to its substance, and the substance does not change. Steam and ice are states of water, for example. A person progresses through the spiritual stations by acquiring virtues and eliminating vices, but they remain the same person. Baha’u’llah and Abdu’l-Baha often emphasized that, while perfections are endless, and “the object of every Revelation [is] to effect a transformation in the whole character of mankind” (Kitab-e Iqan, p. 240), this does not mean that the transformed and perfected individual becomes “a perfect man” in the Sufi sense, or a Manifestation of God. P.S. There is a paragraph in the Foreword to the 2014 retranslation of Some Answered Questions that warrants citation, as an indication of how the harmony of science and religion is being understood today at the Bahai World Centre. Not every Bahai will agree with these thoughts, as is evident from the comments to this post, but they are a useful indication of trends in thinking in the community. A notable case in point is the treatment of the subject of the evolution of species, … which must be understood in light of several Baha’i teachings, especially the principle of the harmony of science and religion. Religious belief should not contradict science and reason. A certain reading of some of the passages found in Chapters 46–51 may lead some believers to personal conclusions that contradict modern science. Yet the Universal House of Justice has explained that Baha’is strive to reconcile their understanding of the statements of ‘Abdu’l-Baha with established scientific perspectives, and therefore it is not necessary to conclude that these passages describe conceptions rejected by science, for example, a kind of “parallel” evolution that proposes a separate line of biological evolution for the human species parallel to the animal kingdom since the beginning of life on earth. This entry was posted on February 3, 2014 at 09:54	and is filed under Bahai Writings. Tagged: Abdu'l-Baha, Baha'u'llah, bahai theology, scripture as literature, بـهاءالله, بهائی, بهائیت, عبدالبهاء. You can follow any responses to this entry through the RSS 2.0 feed. You can leave a response, or trackback from your own site. Sen, what about this note of the Aqdas? “The first sign of the coming of age of humanity referred to in the Writings of Baha’u’llah is the emergence of a science which is described as that “divine philosophy” which will include the discovery of a radical approach to the transmutation of elements. This is an indication of the splendours of the future stupendous expansion of knowledge”. He does say that deadly poison can become (or be changed into) panacea of unfailing efficacy. This is borne out by homeopathy and also, perhaps, by such things as vaccination and even Botox. As difficult as it may be to affect such a transmutation, Bahá’u’lláh has been empowered to accomplish the far harder job of changing hearts. In all of this, I don’t see Him as ruling out certain kinds of literal transmutation but He is certainly saying that the bigger and more worthwhile challenge is changing hearts. One further thing is the interesting fact that the technology now exists to change one element into another, including gold. It involves, I think, bombarding stuff with certain kinds of radiation (regrettably, I’m not a nuclear scientist). Unfortunately, it costs much more than just mining the stuff. I read that someone looked into the matter and specifically the dates when Bahá’u’lláh revealed that tablet and when the technology was developed. Turns out that the time period from the one to the other was 70 years! 70 was also the average life span, “three score and ten”. By the end of our life, are we gold? Sen, I love the metaphors and always viewed this passage as both metaphorical and literal, but had not considered the correlation to Greek physics: “solidarity” = “earth” = “materialism”. So to answer Mark, I might say YES, but only if that life of 70 years has not been too “earthly”. said an entirely incorrect word when reading. One day, so excited to share something she had read, she read a passage to several of us and slaughtered every large word while reading. (We were all familiar with the passage and only smiling, did not interrupt.) But she closed the book and said without hesitation, “now this is what this passage means to me…” and proceeded to blow us away with her profound understanding of the passage. Those three child-like qualities of “purity of heart, chastity of soul, and freedom of spirit” were evident in her and, I feel, constitute that “ethereal” (or to the Greeks, “water”) quality essential to a mystic transformation. “Freedom of spirit” will also help with reading poetry. The human spirit is a rational faculty. To read poetry, or scripture, it must not be shackled to brute fact and causal relationships, it must find associations, commonalities and beauties. It must be free. I have a fundamental problem with your justification about the language of religion being poetic and religion being necessarily Metaphorical. Although I can easily accept an amount of metaphors whose intention and meaning is apparent in the context used (just like the metaphors people use in there everyday communications), any other metaphors that are not clearly cut will become problematic for those who want to adhere to the religion and the divine scripture. For if the meaning of a metaphor is not understood, it will cause ambiguity and misguidance, which is against the spirit of religion itself whose purpose is to guide people to do what is right and refrain from what is wrong, and not baffle them about the meaning of a specific verse or text and creating further divisions and differences. Baffling, using extensive unclear metaphors, and poetic language are peculiar to Sufi and Mystic cults, not divine religions. What is apparent from the text of the Iqan in very simple terms, is the fact that Baha’u’llah wants to show how people change from “bad” to “good”. He uses a metaphor of how “copper” changes to “gold.” The meaning of this metaphor is very clear. “so utterly unlike their previous habits and manners, to be made manifest in the world of being. For their agitation was turned into peace, their doubt into certitude, their timidity into courage.” The touchstone is the evident change in there manners not Baha’u’llah. You see he is clearly stating his own belief which is based on beliefs about alchemy that were known in those days. He explicitly says I won’t explain it furthermore because it has already been mentioned by others, this apparently shows that he did indeed believe in alchemy as proposed by scientists (you have mentioned Islamic scholars which is wrong). “Considering that a century ago, nobody knew the nature of matter, and couldn’t split any kind of an atom, it should not surprise the scientist that ‘Abdu’l-Bahá states that copper can be transmuted into gold. their perceived world view. From this He points them in a spiritual direction. It really has nothing to do with material reality itself (in my opinion), for it is even as the audience intended by the work of the Seven Valleys, and the Four Valleys, which must be understood in the context of Sufism. Whatever the particular “language” of the audience, Baha’u’llah enters into their “world” and, speaking to them in their language, lifts them out of the valley of limitations and earthly meanings and directs them to the heights of Certitude. 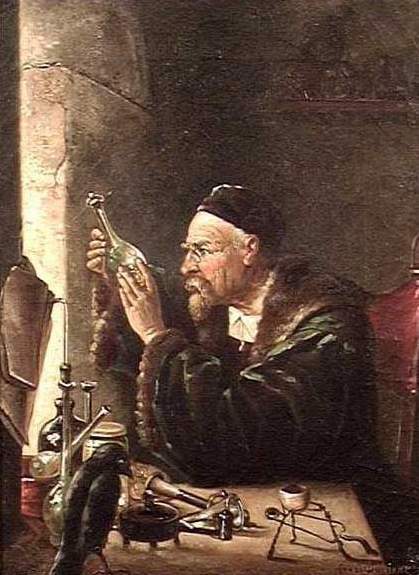 The question of alchemy has occupied the minds of people for centuries. During Bahá’u’lláh’s ministry it was a live issue and several believers were involved in it. Bahá’u’lláh urged them not to seek to achieve it at that time. However, He confirmed that transmuting baser metal into gold, the dream of the alchemist, was possible. He promised that it would be realized, and asserted that its realization would constitute one of the signs of the coming of age of humanity. He also prophesied that after its discovery a great calamity would await the world unless mankind came under the shelter of the Cause of God. But where is this tablet? I am suspicious that he may be reading this meaning into the text, after the fact of Hiroshima. I know of nobody writing before WWII who asserted the tablet existed and had this meaning. Google didnt return anything on that. Consider the doubts which they who have joined partners with God have instilled into the hearts of the people of this land. “Is it ever possible,” they ask, “for copper to be transmuted into gold?” Say, Yes, by my Lord, it is possible. Its secret, however, lieth hidden in Our Knowledge. We will reveal it unto whom We will. Whoso doubteth Our power, let him ask the Lord his God, that He may disclose 198 unto him the secret, and assure him of its truth. That copper can be turned into gold is in itself sufficient proof that gold can, in like manner, be transmuted into copper, if they be of them that can apprehend this truth. Every mineral can be made to acquire the density, form, and substance of each and every other mineral. The knowledge thereof is with Us in the Hidden Book. It is my pleasure to inform you that the “Divine Philosophy” related to radical approach of “Transmutation of elements” as prophesized by Bahaullah in his prophecies was well mentioned by Dr. Walter Russell in his teachings. Where he claimed that any elements can be transmuted into any other elements. I am sure in future based on Dr. Walter Russell’s teachings scientists will be able to transmute copper into Gold very easily. Thus prophecy of Bahaullah have literal meaning and no metaphorical meaning at all. It is good news that Bahaullah’s prophecy has been fulfilled in its fullness. I would recommend to this group to read “The new concept of the universe” by Dr. Walter Russell to have idea about transmutation of elements. It is known today that transmutation is possible: this is not a valid argument for dismissing the metaphorical nature of Baha’u’llah’s 70-year metaphor. It is for example known that whales swim in the sea, yet when Abdu’l-Baha speaks of “whales swimming in the oceans of life” he is speaking metaphorically. Except nuclear fission and nuclear transmutation there is no technology yet developed which will transmute elements into each other. It is not well known at all. My point here is that Dr. Walter Russell’s science is the “Divine Philosophy” which was foretold by great Bahuallah in his prophesy. Every “word” of scripture has 72 meanings: there is no reason why you should not read Gleanings XCVII as a prophecy of Dr. Russell’s as yet unrealised vision, although it is not phrased as a prophecy. The context is clearly that some Babis have objected that the Revelation of Baha’u’llah comes prematurely, just 19 years after the beginning of the Bab’s public mission. Another objection raised by some Babis was that the Bab had appointed Mirza Yahya to some central role (it entailed, among other things, a duty to preserve the Bab’s writings), and in Baghdad Baha’u’llah had acquiesced to the enigmatic ‘leadership’ of Yahya, serving in a way as the outward spokesman for Yahya behind the veil. How could a follower of Yahya now claim a station higher than Yahya, if, as Babis and Bahais believe, the Manifestation of God is not a human who as worked himself up to perfection, but rather occupies a super-human station from birth, indeed, from before the creation itself? This question is pictured as “how can copper (the follower of another) become gold (immaculate, innately preserved from corruption)”? When Baha’u’llah says that “gold can, in like manner, be transmuted into copper,” he is alluding delicately to Yahya’s evident failure to live up to the expectations of the Bab for him. after humanity learns how to push atoms around like legos (nanotechnology)… the next step is learning how to push protons and neutrons around like legos. this will allow any element to transform into any other element. tremendous applications in medicine, but another double edged sword for weapons and warfare. it is worth noting in the prophecy that “the second sign of maturity of humanity is the transmutation of elements”. which means “while inevitable, it won’t happen for some time because humanity must become mature first”. humanity must progress out its warmongering ways before actually becoming mature. But no source is given, so it remains uncertain whether “the transmutation of elements” is a plausible translation. One has to presume that it is not, first because the simple or essential materials in Islamic sciences are not the same thing as the elements of the periodic table in modern chemistry, and second because nuclear transmutation has no relationship with psychological or social maturity. Until the source of this statement is located, it must be regarded as intrinsically dubious. Why don’t you accept the interpretation of the Guardian that the transmutation referred to is literal and not metaphorical? He categorically states that this applies also to Abdu’l-Baha’s references to turning copper into gold. You are clearly rejecting and/or ignoring the authoritative interpretation of the Guardian. Not very helpful Roland, if you do not quote your source. The source is in post number 8 above by Peter. I’ll just copy and paste it for you again then. It is not legitimate to attribute a general signficance to a letter intended for the benefit of a particular person. A doctor may tell the patient what they need to “know” to minimise their stress, although it is not true. A teacher answers a question in terms appropriate to the pupil. And a Guardian helps individual Bahais with their particular difficulties at that time, instructs assemblies about what is to be done, and also defines Bahai teachings in general letters to the Bahai world. Only the last of these have general and unchanging doctrinal applicability. I have noticed you trying to make this distinction before Sen. Whether or not it was written to an individual believer is irrelevant. He is not giving advice to the individual re a personal issue (which might not be applicable to someone else). He is categorically interpreting what the scriptural text means…i.e. what the meaning of Baha’ú’llah’s statement in the Iqan is. Indeed, many of his interpretations are in the form of responses to individual (as well as NSA & LSA) queries about the meaning of texts and various issues. Unfortunately, your approach to such issues has caused you to reject the Guardian’s interpretations re this topic and others such as homosexuality (even when it has been pointed out to you that the Guardian signed and/or approved letter). In a letter to an individual believer, for example, the Guardian states: “We cannot know God directly, but only through His Prophets. We can pray to Him realizing (italicized) that through His Prophets we know Him, or we can address our prayer to Baha’u’llah, not as God, but as the Door to our knowing God.” (High Endeavors, Messages to Alaska, p.71) This interpretation is in complete conformity with Baha’u’llah’s explicit statements that we can only know God through His Manifestations and not directly (since we can never know His Essence). The fact that this is addressed to an individual is pointless as this fact in no way undermines the validity of the interpretation. When we look at the quote you provided this is very clear: “…the secretaries of the Guardian convey his thoughts and instructions and these messages are authoritative…..” They may have less authority than his writings but they are nonetheless “authoritative.” If you choose to split hairs and write a justification fo ra metaphorical interpretation of copper into gold you are still rejecting the “authoritative” literal interpretation of the Guardian particulalry also when one bears in mind that he states this interpretation also applies to ‘Abdu’l-Bahá stating that copper can be transmuted into gold. As I said at the beginning of the post, most important skill for understanding scriptures is familiarity with literary language: the ability to read poetry and similar writing. If you haven’t got it, you haven’t got it (yet). People who cannot read literary language can still be Bahais, but they will have extra difficulties with texts that, in their literal meaning, are quite impossible, such as stars falling to the earth and the like. For them, there is a consoling way out: maybe in the future science will make the impossible possible. Literalists almost always put a high value on science (the leaders of fundamentalist groups almost always have a science or engineering background), so this is comforting for them. But of course this literal reading is impoverishing: it entirely misses the point that mystical transformation can happen gradually, over a lifetime, or, with the help of the ‘elixir’ it can happen in a moment. The transmutation of ‘elements’ is another inner mystery waiting for you to unravel. As for the letters written on behalf of the Guardian by his secretaries, I have dealt with this question elsewhere and I included links to those postings previously. You are of course free to decide for yourself what is relevant for you. The distinctions I have made are those that were important to Shoghi Effendi. I have found that a large portion of the difficulties Bahais face, or that they try to make for other Bahais, come down to 1) reliance on pilgrim’s notes and 2) not heeding his plea that “the words of the Guardian [should be] clearly differentiated from those of his secretaries. Your mileage may vary. I had already seen your notes about the letters written on behalf of Shoghi. In my opinion, those letters are perfectly authoritative and convey what Shoghi had intended because he would always double check them. It would be very helpful if you provide a source (either a book available on the net or some form of verifiable scanned document) for Abdu’l-Baha’s Tablet to Ali Kuli Khan. Unfortunately I do not have the source of that tablet jamaica. It is not in the searchable texts at the Bahai Reference Library. The only place I can think to look is the 5 volumes of the INBA collection devoted to Abdu’l-Baha’s letters, on H-Bahai, which are scanned manuscripts in pdf format. It’s looking for a needle in a haystack, unless someone happens to know where to look. I’ll quote the sections I found relevant to our discussion re letters from his secretaries being “authoritative” and that they “convey his thoughts and instructions”. Although the secretaries of the Guardian convey his thoughts and instructions and these messages are authoritative, their words are in no sense the same as his, their style certainly not the same, and their authority less, for they use their own terms and not his exact words in conveying his messages. I am also puzzled by “less authoritative.” My best reading to date is that the assumption is that such letters deal with administrative matters, ie that it is assumed by all parties that the Guardian’s role as interpreter is never delegated. But he was also head of the community and had a lot of correspondence in that sphere. As regards decisions on administrative matters, “less authoritative” makes perfect sense — the meaning would be, that the decisions conveyed by the secretaries do not set out general policies and principles, but they do say what a particular National Assembly or other body must do now, and must be obeyed. Please take your full time and explain me in full that what is the ‘metaphorical’ explanation can be for such prophecy. I have addressed this section of Gleanings above, see comment #17. So you mean to say there is no possibility that the “Divine Philosophy” will emerge in future which will give radical approach to the ‘Transmutation of elements’. Because according to you it has already happened in the metaphorical meanings. I know that how difficult it is to understand the scripture but you have gone far away. Now I can understand what the priest and interpreters do with the words of a Master after he leaves his body. You are a perfect example of that. I fell sorry for you and for whole Baha community. For your kind information I would like to remind you that the “Divine Philosophy” regarding radical approach to the ‘Transmutation of elements’ was proposed by Dr. Walter Russell. There are many scientists are working on this right now. It has become possible to spread the word because of the invention of internet. I will be highly thankful to you if you can introduce me someone from Baha community who has physics background. I hope you will be able to find one. Much thanks. splendours of the future stupendous expansion of knowledge. However the notes to the Aqdas are merely the opinions of the staff at the Research Department: they have no authority and some have already been marked for removal in a second edition of the translation. In this case, the note gives no source for this claim, and I do not know what text they may be thinking of. Therefore the note seems more likely to mislead than to clarify matters for the reader. Divine philosophy, in the sense of the study of revealed truths (i.e., theology) is contrasted to natural philosophy, which explains material phenomena. In one sense, the divine philosophy already exists, because its essential teaching have been promulgated by Baha’u’llah and Abdu’l-Baha. But these teachings have not yet been widely applied. There are many many spiritually oriented souls who are doing God’s work, but the mass of mankind are materially oriented, still seeking material and technological solutions to problems that are spiritual and ethical at heart. There is a book called From Copper to Gold: The Life of Dorothy Baker It is a wonderful read about how this ordinary woman was transformed to an extraordinary person that changed a community, pioneered to a foreign land to share a Divine message and her transformation into a powerful, knowledgeable, eloquent, heartfelt speaker on the subject or the Baha’i Faith. From ordinary to extraordinary…from copper to gold with the transformative power of the Word of God. It is a story that gives a living example to the wonderfully stated explanations that Sen has shared. In number # 8 above ion this thread Peter quotes the Guardian’s explicit references to physical transmutation (scientists splitting atoms) and the categorical statement that Bahá’u’lláh “was referring to a definite physical condition” yet all you do in the thread is to evade and avoid this and assert in your rejection of the Guardian’s interpretation that literary analysis is required and that it was a metaphorical transmutation. It is as if you are usurping his role and substituting your own interpretation in clear defiance of his role as authorized interpreter. The letter is on behalf of Shoghi Effendi: it is not an authoritative interpretation of the text, and is not necessarily correct. The Guardian could delegate his function as head of the Universal House of Justice, but I have no evidence that he could delegate his role as authoritative interpreter of the text, and the evidence of letters written on his behalf shows that while he had a consist habit of reading the outgoing mail, he did not always align it to his own knowledge and understanding. Further examples are the statements that the Bahai teachings do not specify an age of maturity for marriage, and that saying grace before a meal is a Christian, not a Bahai practice. There are a number of other examples. However your comment and Peter’s both miss the point entirely. Whether copper can be transmuted or not is beside the point: to read Baha’u’llah’s literary tropes as if they are science texts is to miss their literary dimension. To me there seems to be little point in reading Baha’u’llah at all, if one starts with this approach to reading. The best preparation for reading religious literature, is to read literature. Neither I nor Peter miss the point. You referred to a specific passage and interpreted it as having a metaphorical meaning which it does not have. It has a literal/physical meaning as stipulated by the Guardian. We are not talking here about general literary dimensions but about your literary analysis of a specific statement of Baha’u’llah. The best preparation for reading the religious literature of the Faith is not training in literary analysis but rather obedience to the Lesser Covenant–i.e. to the Master’s and Guardian’s explicit interpretations. Training in literary analysis can indeed be very helpful but it is irrelevant and redundant if it leads you to reject a specific interpretation as the Faith is not like other religions where theologians can decide what the text means and have conflicting multiplicities of meaning. Moreover, the logical line of your argument leads to a path in which everything Baha’u’llah wrote could have only metaphorical meanings. He is a Manifestation of God and not a writer like Shakespeare who someone can asses according to the norms of literary criticism. In the Tablet of the Holy Mariner, for example, the authorized interpretation is that He was referring to actual future events and not metaphorical topics with no literal meaning: “Study the Tablet of the Holy Mariner that ye may know the truth, and consider that the Blessed Beauty hath fully foretold future events. Let them who perceive, take warning!” – `Abdu’l-Bahá On the other hand, the Guardian states that “Jinabi Fazel’s explanations regarding the Tablet of the Holy Mariner are so inaccurate and full of mistakes that they should be entirely ignored.”This is why Bahá’u’lláh ensured the appointment of authorized interpreters to avoid precisely the sort of problematic readings (such as your metaphorical interpretation of this passage which is inaccurate and full of mistakes) introduces and which has been the cause of so much religious schism and strife in the past. Further to my previous reply to your very inadequate attempt to justify ignoring the Guardian’s interpretation of this passage as a physical and not metaphorical fact I also refer to your quotation of the secretary’s letter that says that “‘this is the day which will not be followed by the night” (a prophecy of Baha’u’llah, in The Summons of the Lord of Hosts, p. 34) and your erroneous inference that this refers to a never-ending line of Guardians. “On the contrary, although future Guardians are clearly envisaged and referred to in the Writings nowhere is there a guarantee that the line of Guardians would endure forever. Yet, in spite of this, there is a repeated insistence in the Writings on the indestructibility of the Covenant and the immutability of God’s Purpose for this Day. The endowments dedicated to charity revert to God, the Revealer of Signs. No one has the right to lay hold on them without leave from the Dawning-Place of Revelation. After Him the decision rests with the Aghsan (Branches), and after them with the House of Justice – should it be established in the world by then – so that they may use these endowments for the benefit of the Sites exalted in this Cause, and for that which they have been commanded by God, the Almighty, the All-Powerful. Otherwise the endowments should be referred to the people of Baha, who speak not without His leave and who pass no judgment but in accordance with that which God has ordained in this Tablet, they who are the champions of victory betwixt heaven and earth, so that they may spend them on that which has been decreed in the Holy Book by God, the Mighty, the Bountiful. Jamie and Sen are currently discussing whether this passage from the Iqan has a metaphorical meaning or a literal one. There is of course room for it to have both literal and metaphorical meanings, as acknowledged by others above. I tend to revisit this page from time to time so as to rediscover this passage’s meaning, yet I find that the comments section is providing me with an abundance of information but a dearth of clarity. For my own sanity I am going to revisit the pertinent texts and provide my own thoughts. This is mostly a rehash of the debate, but with my own thoughts as well. This apparently troublesome passage from the Iqan is preceded by an exploration of the meanings of “rebirth” and “return” in the scriptures before Baha’u’llah. In the paragraph beginning “It is evident…” Baha’u’llah states unequivocally that the rebirth of human souls is possible and happens as a mystic transformation via the consumption of a “Divine Elixir.” This elixir is a metaphor if ever I read one, in the same way that “rebirth” is a metaphor. The next paragraph begins with, “For instance, consider the substance of copper.” This paragraph is the source of contention in these comments. It is clear that the statement “Were it to be protected in its own mine from becoming solidified, it would, within the space of seventy years, attain to the state of gold,” is to be taken for granted by the reader. Why this should be taken for granted is up for interpretation. Baha’u’llah does not stress a literal interpretation, nor does he yet give any indication it is a metaphor. He simply states it as a fact. Sen says he believes this is a quote from natural philosophers of Baha’u’llah’s time, but that Baha’u’llah did not bother to indicate it was a quote. Baha’u’llah is known to have done this before, in the Tablet of Wisdom (cf. http://reference.bahai.org/en/t/b/TB/tb-10.html note 4 at the bottom). All I can say in confidence is that the reader is being told that this is so, and to take this as a “For instance,” meaning it is an foundational principle for the point Baha’u’llah is to make next. The next sentence is as follows: “There are some, however, who maintain that copper itself is gold, which by becoming solidified is in a diseased condition, and hath not therefore reached its own state.” I don’t know if Baha’u’llah is referring to a belief truly held by Islamic scientists/scholars/alchemists, or if he is now speaking metaphorically regarding a debate over the nature of the human soul. But I do know that we were reading about souls being reborn via a metaphorical Divine Elixir, and that we were then told to take for granted that copper can reach the state of gold if left in liquid form, and that this is an “instance” of the soul being reborn into a purer state. I could take this sentence literally, but that would seem irrelevant to the preceding paragraph, and it should be relevant to the preceding paragraph, because this is supposed to be an “instance” of divine rebirth. So this sentence, referring to a debate among people regarding the nature of copper, makes less sense as a strictly literal fact (as that would be irrelevant to what Baha’u’llah was talking about in the preceding paragraph) and makes a lot more sense as a metaphor for a debate regarding the human soul and its purity. I agree with Sen that this particular sentence has metaphorical meaning, even if it is also literally true as Jamie contends, as it seems thematically out of place as a strictly literal statement. In the next paragraph, beginning “Be that as it may…” Baha’u’llah begins discussing the “real elixir” which can instantly transform copper to gold. It may be that this “real elixir” is a well known concept among Baha’u’llah’s contemporaries, but as a lay reader, I immediately assume that this “real elixir” is a metaphor for the Divine Elixir, as confirmed in the next paragraph. As such, if the elixir is a metaphor, than the copper and gold it transmutes are also metaphors, presumably for the souls of men. I would therefore say that Sen’s metaphorical interpretation is a valid one for all sentences after the sentence, “Were [copper] to be protected in its own mine from becoming solidified, it would, within the space of seventy years, attain to the state of gold.” That particular sentence is not introduced as a metaphor, but is a statement by Baha’u’llah, used as a foundation for the metaphor that follows. It may be a truth on reality affirmed by Baha’u’llah (Jamie’s position), or it may be a quote from natural philosophers in His day (Sen’s position), but it is not itself stated as a metaphor. We should recall that Baha’u’llah did describe alchemy as a “vain and discarded learning” (Iqan pg. 186). If the belief that copper turned to gold after 70 years in liquid form was common only to alchemists in His day, then it would seem more likely that Baha’u’llah did not literally believe this statement to be true, and was only employing this idea for the metaphor. If, however, he introduced this specific idea in this Tablet, then I would say it is more reasonable to say He truly believed and taught this as a literal truth regarding metallurgy and the transmutation of elements. In short, based solely on the Writings of Baha’u’llah (the Iqan and the Tablet of Wisdom), I believe that both a literal interpretation and a metaphorical interpretation are plausible, but that the metaphorical interpretation seems more intended. To be more certain, familiarity with the writings of Persian natural philosophers would be useful in determining His intent. Jamie and others in this comments section contend that these verses have a literal meaning, regardless of a metaphorical one. Some comments even state these verses do not have a metaphorical meaning, but I believe all but the one (“Were it to be protected…”) certainly do have metaphorical meanings, based on how and when Baha’u’llah introduces the subject of metals and transmutation. So I will explore whether they also definitely have a literal meaning in addition to the metaphorical meaning, rather than force this into a dichotomy of literal vs. metaphorical. I do not believe that a justification of literal meaning can be derived from Baha’u’llah’s Writings alone, as He does not always distinguish quotations from external sources from His own beliefs and He is known to speak in metaphors quite often, so we must seek guidance from the authoritative interpreters if we wish to conclude these verses have literal meanings. Shoghi Effendi is such an authoritative interpreter for the Baha’is, as Abdu’l-Baha gave him that authority, who in turn was given that authority by Baha’u’llah. Whether this authority/infallibility for statements by the Guardian or Abdu’l-Baha protects them from factual error, or is merely a covenant that Baha’is must trust them regardless of their perfections, I cannot say. But we must adhere to their statements regarding the interpretation of scripture. What astounds me is that some readers are presuming that this means that Baha’u’llah definitely spoke literally. This whole letter is riddled with uncertainty, and merely asserts possibilities regarding His meanings, and obligations regarding the beliefs of His followers. The first paragraph is an apology for Abdu’l-Baha’s use of outdated scientific language regarding transmutation, pointing out that it was the language common in His time. The second paragraph says it is possible (but does not guarantee) that one day we will be able to change the mass of atoms. This paragraph does not say we should believe scientific statements in the Writings of Abdu’l-Baha literally, it only says we should not rule out literal interpretations because they are not confirmed as of yet. It says we should leave room for possibilities, and that is all. The third paragraph says we should view Baha’u’llah’s Writings on copper and gold the same way. The fourth paragraph says we “must assume that… He was referring to a definite physical condition which theoretically might exist,” on account of Baha’u’llah having “access to all knowledge.” Read that again. We must assume (assuming is not “knowing”) that Baha’u’llah was referring to a definite physical condition which “might exist” (ergo might not). We must assume this because we believe “He had access to all knowledge,” so this is undeniably a possible meaning of His. But this is an “assumption” we must make, and it is regarding a “theoretical” physical condition that “might exist.” Now, this means that I, as a Baha’i, cannot rule out that Baha’u’llah may have been speaking literally. Indeed, I should assume he might have been speaking literally. That does not prelude the possibility He was not speaking literally. He could have been only using metaphors! That is allowed by this guidance up to this point. I just need to assume it is possible He was also speaking literally. The final paragraph affirms that the “principle of Faith is to accept anything the Manifestation of God says…” So, according to the Guardian (via his secretary), when I read the Iqan, I must accept that copper can be turned into gold in 70 years. That is my duty as a Baha’i. This paragraph has no bearing on the actual meaning of the verses, but it is a guidance for how the believer should engage with the Writings. So to summarize, it seems that Baha’u’llah generally believed that alchemy was a pseudoscience, but He still used it in His writings for metaphors quite often. In the Kitab-I-Iqan, he wrote a statement that seems to affirm a definite physical condition that is not yet confirmed by science, and he used this condition as a metaphor for the transformation of the human soul. Because the Kitab-I-Iqan requires the reader to accept this statement as true for the metaphor to make sense, I, as a Baha’i, should accept it as true so as to best receive the revelation of the Iqan. This does not guarantee that the statement is an absolute fact, but accepting it is my obligation as a Baha’i, and it is a key component of having Faith. Whether I need to continue to accept this statement outside of the context of the Iqan is unclear, and possibly irrelevant to my spiritual growth. Time will tell how scientific advancements are made. Thank you Neale. I disagree on one point, where you wrote “the Kitab-I-Iqan requires the reader to accept this statement as true for the metaphor to make sense.” Generally speaking, a metaphor does not require a factual foundation, or the belief in one: it only requires that the reader or hearer can surmise what it is meant. For example, if I say that I’m living as happy as God in France, you do not have to believe that God is actually happy when in France, to understand the saying. If I say that a suggestion went down like a lead balloon, you do not have to believe that anyone has actually made a lead balloon to test its rate of downward acceleration. I know what “as blind as a bat” means although I know bats are not blind. Thanks a lot Neale for the beautiful expose’ on the matter. To me it is very clear that in Iqan Baha’u’llah has used transmutation of copper to gold after seventy years as metaphor to convey a deeper spiritual message, and attaching a literal significance would certainly deter from a deeper spatial intent. However, this should not lead me to rule out a literal interpretation. I am, therefore, somewhat puzzled by the Sen’s insistence of rejecting any possibility of the text having a literal interpretation at all. After all as Sen himself has stated in post 17 “Every “word” of scripture has 72 meanings”. Why can’t one of those 72 meanings be literal?! While every word has multiple meanings, not every meaning that everyone finds is a good and correct meaning. Sometimes people misread a text, or impose an invalid meaning on the text and its author. Scripture is the creative word: it has one multi-layered meaning for the people to whom it is addressed, and more meanings for subsequent generations. For example, 19th-century New Zealand Maori found meaning in the Old Testament narratives of the promised land and the trials of the Hebrews, which could not have been in the minds of the authors. But some of these were good meanings, consonant with the original meaning and bearing good fruit. An example is the New Jerusalem built by Rua Tapunui Kenana and his followers. However the same texts and themes are used by the Lord’s Resistance Army, in ways that are not consonant with the historical meaning, and not informed by the spirit of faith, and do not bear good fruit. This is the instrumental use of scripture to justify inhumanity. In addition to consistency with the author’s meaning in context, I apply the standards of being informed by the spirit of faith, and bearing good fruit. The spirit of faith is evidenced by charity in dealing with others (among other things). You can scan the comments yourself to see that, in some cases, it is missing — or I fail to discern it! And what are the fruits of Bahais maintaining that Bahai beliefs include the teaching that copper turns into gold after 70 years if protected from becoming dry? This was the incredulous question that was put to me at the beginning of this posting. Does this make the Bahai Faith attractive, or is it a barrier set up, by these Bahais, that hinders seekers from finding the One who is sought? Does it mark the Bahai community as a reliable and predictable partner for governments and NGOs in dealing with problems, including scientific issues such as global warming? Does it encourage Bahai youth to study the physical sciences and take the findings of science seriously? Or does it rather set up a dichotomy of thinking, in which ‘faith’ becomes a distinct sphere in which one believes what ain’t so? Sen, I agree with you that the only meaning and intent of the text in Iqan is spiritual and one should waste time and look for a physical interpretation. However, from multiple other sources (which you tend to reject), a literal possibility has not been ruled out. Of course if it has not been ruled it does not mean that it is a scientific certainty. It simply mean we do not have enough knowledge to ascertain one way or the other. The text of the message written on behalf of the Guardian posted earlier and the reference in Má’idiy-i-Ásamání, vol. I, p. 41 and note in Kitab Aqda all point to such a possibility, and not a certainty. Not knowing something to make a definite assertion for or against it should be our attitude on this matter. We simply do not know to state one way or the other. That said it should be clear to all of that the real purpose in the text in Iqan is elucidation of a spiritual principle and not a statement in chemical analysis. LIke you I tend to attach only a metaphorical meaning to the text, and nothing else. But it seems you have gone one step ahead of everyone else and have discovered for certain that there is no scientific possibility of attaching a literal interpretation of the text in Iqan. It is fine if you have made that discovery. BUT what I find to be untenable is that to sustain and water-proof that strong personal discovery, you are attempting to disregard or reject any authoritative text that hint at a possibility (as opposed to a certainty) of a literal interpretation. In sustaining your belief you even find it necessary to question the authority of the text of the messages written on behalf of the Guardian. Is that really necessary?! On the one hand, you say, “the only meaning and intent of the text in Iqan is spiritual” and “said it should be clear to all of that the real purpose in the text in Iqan is elucidation of a spiritual principle and not a statement in chemical analysis.” That is what the text tells us about Baha’u’llah’s message here. On the other hand, you say multiple other sources have failed to rule out the possibility the copper will turn into gold if it is kept dry in a mine, therefore “we do not have enough knowledge to ascertain one way or the other.” By that logic, if someone has failed to rule out the possibility that the earth is flat, then it might be. If some people are unconvinced that water always seeks the lower level, then somewhere it might be found flowing uphill. But copper simply does not turn into gold in a space of seventy years: this not an open question waiting for an answer. Nor is it a discovery I have made. Spontaneous transmutation doesn’t happen, and it cannot happen in the universe we live in. The idea goes beyond science fiction to bizarro fiction, writing that appeals by its weirdness. Can we imagine the results, if elements did transmute spontaneously? It’s an entertaining thought, but it’s not the universe we live in. If people think this is a possibility, they are ignorant – the impossible does not become possible because of their thoughts! A separate question is, is it possible that Baha’u’llah entertained this idea in a literal sense? Yes, it is a possibility, given his time and environment. No doubt there were people who did not rule out the possibility of spontaneous transmutation. But if someone wants to claim that Baha’u’llah was one of them, the onus is on them to produce the evidence. This passage in the Iqan is not that evidence, because in context the reference is clearly meant metaphorically. If there were an authoritative interpretation which says, this passage in the Iqan refers to the literal transmutation of elements, that would undermine the credibility of the source of the interpretation – it would not somehow create a universe in which the transmutation of elements is possible. Fortunately, there is no such authoritative interpretation. Finally, is the chemical elements reading, not intended by Baha’u’llah, a new meaning unfolded from the text under the guidance of the Holy Spirit? In my opinion, it is not, for the reasons I provided previously. It is a reading mistake, which hinders seekers from finding the One who is sought, and marks the Bahai Faith as something akin to a flying saucer cult. This is my opinion, which also means that I am bound to do my best to combat this idea. Not all ideas are equally true, or beneficial. There is no doubt whatsoever that He is referring to literal copper and gold and other minerals whose density, form, and substance can be changed. No metaphorical meaning at all. This quote could also easily be viewed as metaphor. But even when taken literally, it is scientifically true. We now know that transmutation of elements is indeed possible, and we are even able to achieve it in a very crude fashion using particle accelerators and nuclear reactors.. I am not sure why you object to it? Nor does this passage being literally true mean that other passages regarding copper and gold must also be taken literally. I think those who insist that various passages on the topic mean ONLY one thing, and can have no alternate interpretations whatsoever, are erring on their judgments. Yes, each passage has its own context, and therefore, its primary interpretation should be clear within that context. But saying that attribution of any secondary interpretation is impossible, and even ridiculing the intelligence of those who even make an allowance for such secondary interpretations sounds to me going to the extremes. Mathew, I am not sure how you could conclude I object that it is possible when I explicitly state the passage is literal (i.e. transmutation is possible). I am also unsure how you and Sam could conclude it is metaphorical. The “density, form, and substance of each and every other mineral”: minerals, vegetables and animals have density, form and substance. What is metaphorical about that? Copper and gold have density, form and substance. What is metaphorical about a mineral or its density, form an dsubstance? A motif can be metaphorical without every element within the picture being independently metaphorical. In this case, I see no need to find what the density stands for, what the form stands for, what the substance stand for, because I don’t see anything in this or the other similar texts that suggests that Baha’u’llah wanted us to read it that way. His metaphor compares the theoretical possibility of transforming the characteristics of one mineral into another (it is theoretical, because it is in “a hidden book”) to the possibility that Baha’u’llah, outwardly a follower of Mirza Yahya as head of the Babi community, might become an independent Manifestation of God, while Mirza Yahya, outwardly the head of the community, might decline in power. (To see the context regarding Mirza Yahya, join Gleanings CXVII with Gleanings L, “How foolish are those who murmur against the premature birth of His light…” – Gleanings CXVII and Gleanings L are two parts of the same tablet by Baha’u’llah). “I don’t see anything in this or the other similar texts that suggests that Baha’ullah wanted us to read it that way”: this is the crux of your problem and has been for decades. Only the authorized interpreter of the Writings of Baha’ullah, Shoghi Effendi, knew and could explain what He meant and I have quoted several times (also re your Consensus of the Faithful and other essays) that he states it means that Baha’u’llah “was referring to a definite physical condition which theoretically might exist.” There is nothing metaphorical about “a definite physical condition” yet you persist in challenging the Guardian as you have been doing for decades by substituting your own interpretations and trying to justify your position by challenging the validity of the letters written on his behalf. Shoghi Effendi also states that “Considering that a century ago, nobody knew the nature of matter, and couldn’t split any kind of an atom, it should not surprise the scientist that ‘Abdu’l-Bahá states that copper can be transmuted into gold” and there is nothing metaphorical about atoms whatsoever. As Brent Poirier asked in his comment on your latest essay, please take time for self reflection as you are definitely not endowed with the ability to understand the sacred Texts as the Guardian was endowed by Baha’ullah to preserve the unity of His Faith. hello Sen, what about 19 mithghal of gold as a fine when copper will turn gold easily? Thank you.